T AMERICAN ROOF COMPANY we offer a variety of services to choose from for residential, commercial, industrial and other flat-roof situations. These options range from installation during new construction to replacement of old and unrepairable materials, restoration of deteriorated roofing or on-going maintenance programs designed to extend the life of your roof for years at the minimum possible cost. AMERICAN ROOF COMPANY is certified and approved for application of U.S. Intec, Inc. roofing systems which provide the industry's finest and most comprehensive roofing warranties. In fact, no other manufacturer has more dedication to modified bitumen performance! That's why architects, specifiers and building owners count on U.S. Intec for unmatched quality. AMERICAN ROOF COMPANY provides these products because we are dedicated to providing our clients with the highest possible quality. We know our success depends on your satisfaction. That's why we use highly trained professionals and the finest materials ... like those offered by U.S. Intec. Is it time to reroof? Or is it time to put in place a roof maintenance program? If you postpone a several-thousand-dollar reroof expenditure, you're miles ahead. Let the roofing professionals at AMERICAN ROOF COMPANY explain what would be the best for you. In most cases, you'll find that your company can save tens of thousands of dollars and significantly delay the major cost of a complete replacement. 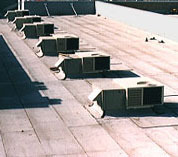 Contracting with AMERICAN ROOF COMPANY can keep your existing roof in prime shape.